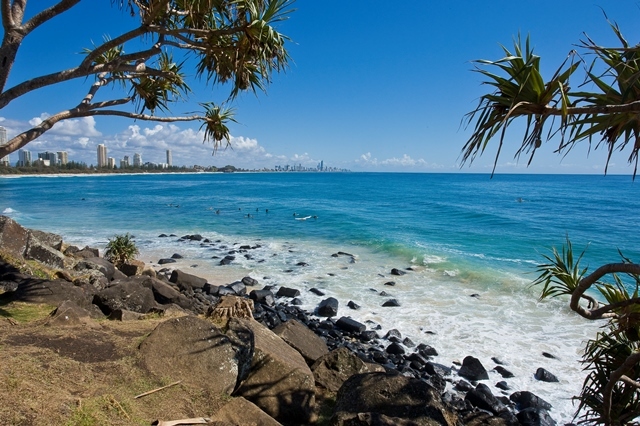 This Superb Snapshot lets you delight in some of the more unique coastal and aquatic opportunities the glorious Gold Coast offers the traveller “in the know”. There will be amazing and unbelievable photo opportunities around each corner. Try an afternoon surf adventure on a stunning and uncrowded beach, a whale watching cruise in one of the greatest marine parks in the world or loose yourself in a close up encounter snorkelling with the curious turtles at Cook Island. If that’s not enough how about a progressive dinner mingling with the locals or a magical morning walk on one of the cleanest beaches in the world. It’s a short tour with plenty to do assuring you of a once in a lifetime #snapshot. The Gold Coast is the picturesque beachside location where Australians choose to go on holiday. Without wasting a second of the tour we start by visiting a local favourite beach to view the surfers enjoying the clear blue waves. Take a walk on the beach or grab a coffee before continuing onto your hotel to freshen up before spending an afternoon of fun learning about the regions surf culture. Travel to an uncrowded beach for a hands-on surf knowledge/lesson with some true blue experts – all abilities are catered too in a safe and fun environment. There is a chance for you to try your hand at a boomerang throwing and wander along beach looking for wildlife. Humpback Whales are the stars of the show today although the tours often encounter Bottlenose Dolphins, Common Dolphins, sharks, turtles and albatross. Within 20 minutes of departure you will be assisting our expert crew to find Humpback Whales by scanning the horizon for the famous “blow”. At this point in the tour there is always great anticipation which quickly turns to excitement when a distant splash or a great exhalation of breath confirms we have found a whale. Venture to another favourite beachside suburb for a guided easy walk through a coastal National Park. Then indulge in the vibrant food scene of the Gold Coast with an exciting progressive dinner visiting several restaurants as you mix with locals and holiday makers. Tour includes: Well located accommodation, breakfast daily and meals as indicated, unique experiences, seat and coach touring, time with passionate locals, plenty of photo opportunities, private vehicle transfers. Will Depart Any Day of The Week! Notes: Whale season runs from June to November of each year. Out of season a luxury calm water cruise and lunch is run in place on the whale watching cruise. During this time our Gold Coast Coastal & Aquatic Tour departs on Fridays, Saturdays & Mondays of every week.